This artist's concept shows NASA's giant rocket, the Space Launch System, soaring off a launch pad at the Kennedy Space Center in Florida. The rocket is NASA's new booster for deep space missions to an asteroid and ultimately Mars. NASA's next-generation rocket, a behemoth of a booster expected to launch astronauts deeper into space than ever before, has passed a major design milestone, space agency officials announced Wednesday (July 25). The new mega-rocket, called the Space Launch System, passed a series of reviews that laid out the technical, performance, cost and schedule requirements for the heavy-lift booster. The completion of the so-called System Requirements Review and System Definition Review allows program managers to proceed into the rocket's preliminary design phase, NASA officials said. The Space Launch System, or SLS for short, is NASA's go-to rocket to carry NASA's planned Orion capsule and possibly other future payloads beyond low-Earth orbit. The rocket is being designed to carry out the agency's future human space exploration goals, such as sending astronauts to visit an asteroid or Mars. The NASA reviews established the requirements for developing the rocket in line with the agency's budget and schedule. The $10 billion booster is slated to launch on its first test flight in 2017. An artist rendering of the various configurations of NASA's Space Launch System (SLS), managed by the Marshall Space Flight Center in Huntsville, Ala. The flexible configuration, sharing the same basic core-stage, allows for different crew and cargo flights as needed, promoting efficiency, time and cost savings. The SLS enables exploration missions beyond low-Earth orbit and support travel to asteroids, Mars and other destinations within our solar system. "The in-depth assessment confirmed the basic vehicle concepts of the SLS, allowing the team to move forward and start more detailed engineering design," Gerstenmaier said. An independent review board, made up of technical experts from across NASA, evaluated the rocket's specifications, budget and schedule. 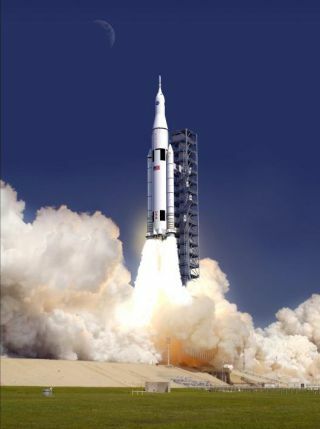 The officials determined that the SLS program is ready to proceed from concept to design. "This is a pivotal moment for this program and for NASA," SLS program manager Todd May said in a statement. "This has been a whirlwind experience from a design standpoint. Reaching this key development point in such a short period of time, while following the strict protocol and design standards set by NASA for human spaceflight is a testament to the team's commitment to delivering the nation's next heavy-lift launch vehicle." The milestone comes less than 10 months after the birth of the SLS program. The next major milestone, a preliminary design review of the rocket, will occur late next year. The SLS rocket will be able to launch at least 70 metric tons of material into space at first, but the agency is hoping to evolve the booster to reach a launch capacity of 130 metric tons in subsequent upgrades. The first test flight of the SLS is scheduled to occur in 2017. In its fully evolved state, the three-stage SLS will be the most powerful rocket, surpassing the capability of NASA's Saturn V rockets that carried astronauts to the moon during the Apollo program.